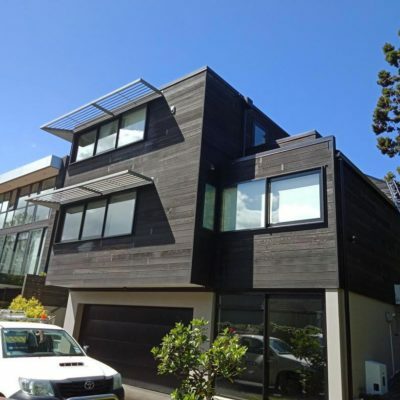 After washing thousands of houses around the Auckland area we thought it might be handy to put up a house washing guide that highlights a few of the things that we know to help those washing their house themselves or just for those to see how we like to go about our house washing work. All house washing work, no matter the style of house, is largely similar. House washing is the process of removing all foreign material from the house. This house wash guide will walk you through the process of and give tips and techniques to ensure a great house wash and maximum efficiency. 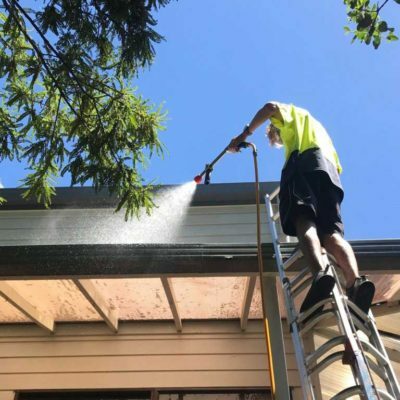 A standard house wash consists of – removing all cobwebs, cleaning the outside edge of guttering, eaves, barge boards, gable ends, flashings, all cladding, outside of windows, doors and exterior frame work and paint work. Use a low pressure chemical nozzle to apply soft house wash solution to one wall of the house (apply from the bottom of the house up to avoid streaks), make sure every inch of surface is wet with chemicals and allow the it to soak into the dirt and grime for between 1 and 3 minutes so that it’s easier to wash off, then, using your white nozzle, thoroughly rinse off all foreign matter from the house before the chemical dries up. Use your brush to loosen up any remaining dirt around door and window frames and rinse again so that you don’t have to use as much pressure when washing around window edges. Repeat the process on the next area. Time saving tip: when a home has balconies or porches with balustrades, wash the outside edge of the porch and balustrades first and wash the house last. The dirt that gets squirted from the balustrades towards the house can then be rinsed off the house when it comes to washing the house. Always always double double check your work! After completing a house wash, slowly walk around the house and check every nook and cranny, behind barge boards, under weather boards and all sides of window frames. Getting into this simple habit will help you to discover the spots you most commonly miss and the extra effort doesn’t go unnoticed. A chemical mix combining sodium hypochlorite, water and citrus wash is the most effective for removing grime, mould and dirt from a house with the least amount of effort. The sodium hypochlorite dissolves most forms of light mould and dirt, and the citrus wash helps to lower the surface tension of the water so it can further penetrate grime more easily than sodium hypochlorite alone. The citrus wash also helps when rinsing windows to leave them streak free. Note: The citrus wash creates bubbles/foam and helps to make it more evident when the house washing solution has reached your gun through the hose from the venturi. For houses that are not overly dirty, or have delicate plants and vegetables in close proximity to the house, it pays to use a weaker mix of the sodium hypochlorite to carry out a house wash. Method: In a 20L container add between 500ml and 1L of pool grade sodium hypochlorite, then fill the container almost to the top with water and top up with between 250ml and 500ml of citrus wash or sugar soap. For more prevalent mould and grime. Method: In a 20L container add between 2L and 5L of sodium hypochlorite, then fill the container almost to the top with water and top up with between 250ml and 500ml of citrus wash or sugar soap. Warning: For red mould only. Method: Feed the venturi hose directly into your container of sodium hypochlorite. Apply the chemical to red mould and scrub in. May require 2 or more applications and rinsing and/or blasting. Note: Use a chemical grade mask and avoid coming into contact with solution at full strength. Pro Tip: For best results spray the dry surface with the solution, do NOT wet the area first. Note: These mix rates are as a guide only. See Material Safety Data Sheets (MSDS) for further information. 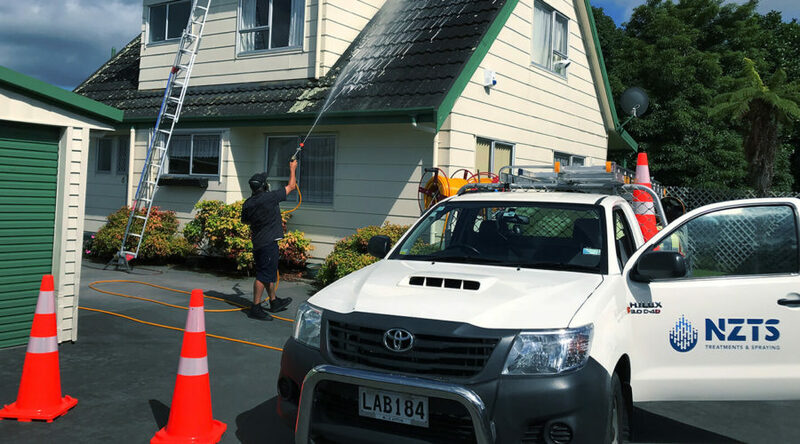 Hose management is particularly important on house washing jobs, give thought to any delicate plant life and be aware that pulling hose through gardens, around the corners of a house, or around things like fences, can cause damage. Each time you move around the corner of a house with the gun, gather the hose by pulling the hose from the water blasting unit towards you at the corner. Then you can walk forward with the gun without having the resistance of pulling the hose around a corner. Repeat the process as you move back around the house. Note: Pot plants are a hoses worst enemy, move them away from work areas to avoid damage. Note: Grabbing the hose in a bunch and dragging it back around the house together will more than likely leave you with a tangled hose and will create an extra job, wasting your time. Here is a great article about damage from incorrect house washing techniques and how to avoid them. If you have to wash a house from up on a balcony or porch, take the gun and hose through the balustrades, not over the top of the handrail. You’ll be less likely to leave damage and marks. Close and tightly latch windows, this will help to stop water and chemical sprays from entering the house while washing. Apply chemicals to windows and doors at low pressure, keep the tip of the nozzle more than a meter from the surface of the house and move the water blasting gun in a swift, horizontal sweeping motion while spraying. It helps to keep the spray from the nozzle in a vertical line across the house, this minimises ingress through the tops of window frames and any gaps in weatherboards (the most susceptible areas). As you are washing a house, identify problem areas e.g. gaps in window frames, weatherboards, cladding and gaps under doors. Use your telescopic brush to scrub these areas before rinsing off chemicals. This will allow you to rinse dirt off using less water and less pressure minimising ingress into the house while washing. Rinse off dirt from around window and door frames by spraying water at an acute angle sideways across the building, less than 45° is optimal for dramatically reducing ingress. Keeping your distance while rinsing off will help to minimise ingress into the house also. Pro Tip: Take your time with rinsing off walls and windows, it should take around 3 times longer than applying the chemical to achieve the best results. Pro Tip: Keep a roll of duct tape to tape up large gaps at the base of doors, or where the ground falls towards a door, or if clients are particularly concerned about any water ingress. Use good quality duct tape to minimise the risk of pulling off old or flaking paint. One of the best ways to speed up your work and stay safe is by enabling yourself to be able to stay on the ground and complete work satisfactorily from there. This saves you from having to handle ladders around properties and climbing to get close to your work. Ensure you’re using a strong enough mix of chemicals. The correct mix should work effectively on stains out of your reach and you will avoid having to get close to them to blast them off. Getting your chemical to a height can be done by using a longer wand, or spraying the chemical up high using a red 0° jet nozzle. Pro Tip: Fill your hose with chemical using the black nozzle, swap to the red nozzle and shoot the chemical up to the area you need to wash, let the chemical soak in over the course of a minute or two. Then rinse using the red nozzle once water reaches the lance again. The right extension brush can reach high to scrub stubborn stains and lichen from the ground. 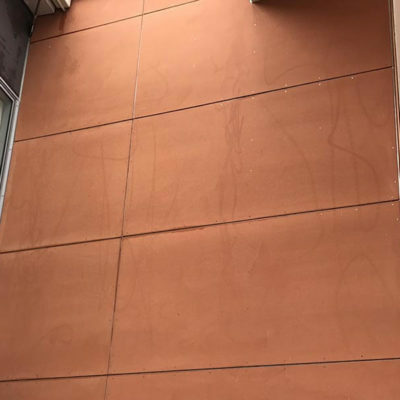 Depending on the painters’ requirements, they will generally request a thorough chemical wash combined with water blasting to remove flakey paint. A chemical wash should always be highly recommended as it kills any organic matter attached to house surfaces. Note: Painters biggest gripe is with dirt still being left on the under side of the bottom 3 or 4 weatherboards. It’s easy to forget these areas, as they’re not visible when standing looking down. Form the habit of aiming your gun up under these lower boards to apply chemicals and rinsing off with water. As a part of your house wash, it’s nice to include exterior windows. It doesn’t take a lot of effort to get streak free results. Once chemical has been applied to the house and windows, give the windows a quick scrub with your soft house wash brush. Once it comes to rinsing off the chemical from the house, leave the windows until absolute last after all the chemical solution and any dirt is removed from the rest of that wall of the house. Next, proceed to rinse the windows with a generous amount of water (see ingress control to avoid leaks inside). Windows should then be double checked at the end of the job and may require a further rinse. Tip: Often streaks aren’t visible from certain angles, so walk slowly past the windows when checking to better reveal any streaky spots.